My sister Anna had her first baby this august, an adorable baby girl named Ebba. She's the love of our entire family and naturally I had to make her a quilt! 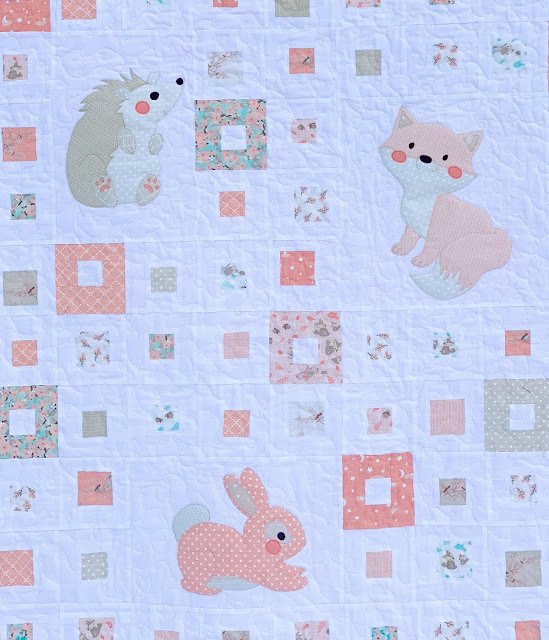 It's made in Katie and Birdies beautiful Lullaby fabric line matched with Kona Cotton in white. It's based on the free Thicket quilt pattern available here. And below comes the little fellow that started it all, the fox! Baby Ebba got a small fox toy some six months before she was born from her parents - and it disappeared when me and Erik visited! There was a lot of investigation surrounding (and allegations I might add!) this and I decided I had to make a quilt featuring the fox, should it not turn up. I looked for several months for the perfect fabric for this quilt (my sister and her husband have fantastic taste and I didn't want to make something they'd feel didn't work in their beautiful apartment) and when I stumbled on Katie and Birdies beautiful Lullaby line, I knew that's the perfect one! Of course it was out of print and near impossible to find someone who would ship to Sweden! I found a layer cake and ordered it to my mother's place. It arrives and when we're going to our quilt retreat this summer - it turns out it was only the border fabric that had arrived, not the layer cake! The horror! The after much auditioning of different animals, the hedgehog and bunny was included because there's adorable such on the fabric, and they're too cute not to be included with the fox. The bunny being assembled, you can also see a little of my "pretty" bunny sketch in the background. Luckily I'm much better at sewing than drawing. When making this quilt, this was the first time I sewn a full quilt on my beloved Juki 2200 QVP mini (that I just realized I haven't introduced here yet, ohhh gosh! ), and I'm so happy with how it was to work with. Sooo easy! Sooo much space! I'll make a proper post with a review of this machine shortly. As "what machine do you use" is one of the most frequently asked questions for me. The back turned out great too, and the little animals show so sweetly. 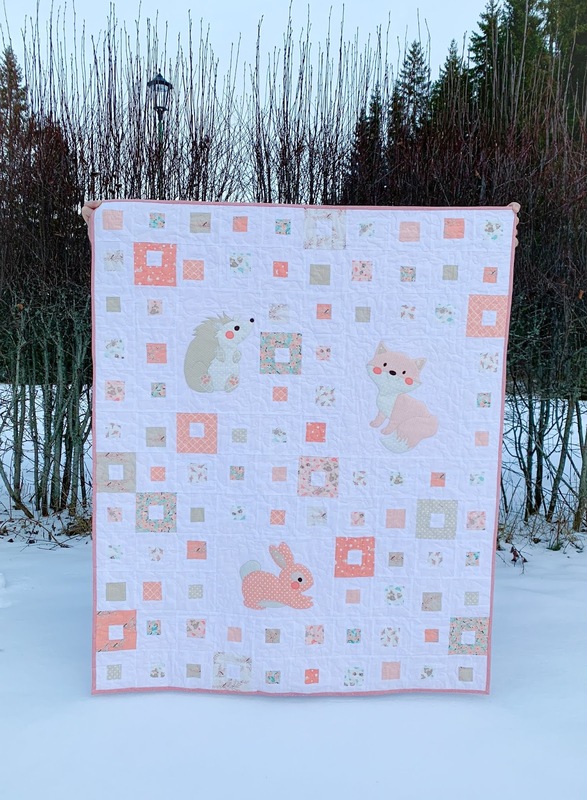 Freemotion quilted it with all over swirls with hearts thrown in for extra love for baby Ebba.